i got myself all motivated and started straightening up the house. most people wouldn't know it, but i'm a terrible housekeeper and i'm sort of okay with it. 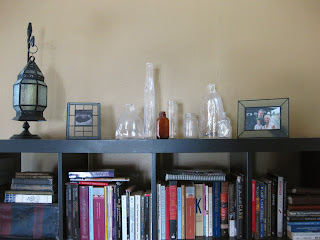 of course i prefer when the home is neat, but it doesn't make me crazy if it's not. most people don't know this about me because the rare times i do clean occur when people (like you) come to visit. so i'm pretty sure i've fooled everyone into thinking that is the normal state of our home. indeed it is not. so, i got right to it and tidied, tidied, tidied. this mostly involved moving piles of clothing, books, magazines, and miscellaneous items that have never been given a home in our new house. i rearranged some stuff, threw out some other stuff, and okay, i hid some stuff too. but i also changed the sheets and made the bed! 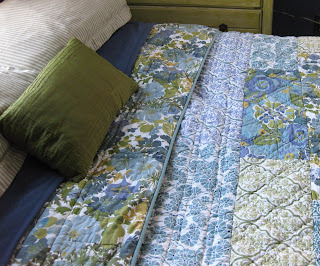 sometimes we kinda, pull the quilt towards the pillows, but i don't think i'd really made the bed since we moved in. that's our NEW baby on the left! we need some stuff on the walls, but the floors are finally clear!!! i promise i won't post everytime i'm proud of myself for cleaning. in fact, now that the major overhaul is done, i'm going to try to keep it up. what are your favorite cleaning gadgets? 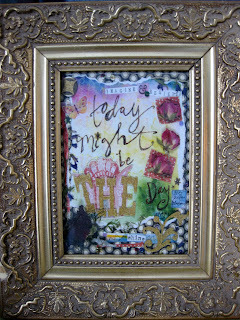 do you have a "day"? or do you clean a little bit every day? do you really make your bed every day? My favorite cleaning gadget is Chad. He he. There aren't any gadgets that are my fave or that make cleaning easier or more fun. Having people over helps get the job done. I think we are alot alike in our housekeeping prowess. We don't have a day. We do it when it gets dirty. Dishes are done everyday. You do not want to see our bedroom right now or the office. But we try to keep the common areas (living room, bathroom, and kitchen) cleaner and tidier. But I still wouldn't like someone to just drop by. I used to do the cleaning during commercials. Ha! You can get ALOT done in a 3 minute commercial. Now I do it sometime before Chad gets home. Lol! Chad likes a made bed so I try to make it about twice a week. Lol! 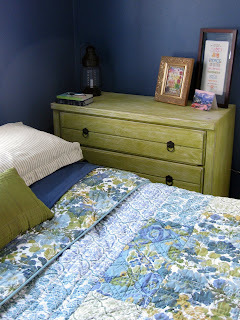 It is amazing to me how much nicer the bedroom looks with clothes all over the floor and dresser but a made bed. It is all an illusion. My word verification is "creepith" What a weird word. I am laughing out loud at manda's comment!! that is funny. cleaning gadgets that i love are: the swiffer duster & the magic eraser--which i use on our porclien sink & bathtub & walls & kids...oh wait, can't use it on kids. :) OH, i love using baby wipes to do the quick wipe down of the bathroom sink & toilet if there is a quick clean situation!! before kids & this house, i used to have a day that i cleaned, but now it is typically when chris complains or starts cleaning that i notice it is time to clean. or when people come over for a visit. i usually try to keep the main floor pretty clean, but the kitchen always seems to be messy. just a little bit at a time. i would say our upstairs gets cleaned once a month...if that! :( yikers! i grew up with a mom that made sure i made my bed everyday...so i try to make my bed everyday...but it doesn't happen if chris is still in it when i wake. i agree with manda...the room looks so much neater with a made bed. weird, my verification word was "boothie"....i kinda like it!! so your equally unclean sister declared to myself a few weeks ago that I was going to have a cleaning day. I figured, I usually spend Bennett's nap time either on the computer or in front of the TV so I can sacrifice one of those days to clean. I tell you what, there's definitely something about knowing what day it is and being prepared for it that makes it so much more bearable. Not to mention being proactive and cleaning before its disgusting feels a heck of a lot better too! I did it two weeks in a row and this week I skipped due to croup so next Monday I'll pick back up again. I think you should try it! Its changed my feelings about cleaning. I try to clean up when no one is around because I like the quiet time. It helps me to plan out my day and reflect. I find it kind of zen...? Is that weird? I feel like I am so much more confident & upbeat with a clean place. I love all method products. Swifter is great for the floors but for a quick fix, I use a hand broom and dust pan. Comet for the stove and green works products are great too! P.S. For a quick fix, I hide stuff in places all the time, haha! First off-LOVE your house! Your bedroom color is gorgeous. I love a girl who likes color on her walls! Can't wait til we feel better so you can come help me with my house! My fav cleaning products are any of the Method stuff. It's safe, it works, it smells good and it has fun packaging.